Mainz/Davos, October 20th, 2006 - It will be a landmark in the Alps: After the opening of its resort in Berchtesgaden Germany, two years ago, the InterContinental Hotels Group (IHG) will operate a five star superior resort in Davos, Switzerland. The hotel with 180 rooms and 60 luxury apartments is to be developed by Feuring – Visionary Hotel Development. The opening is scheduled for the year 2010. Stilli Park AG is the owner. The unusual design was conceived by Matteo Thun. The architect, who is a star amongst his kind, has designed a corpus - the exterior of which will remind of a ufo with soft swinging shapes - that is sure to make history as an outstanding example of modern architecture. The round-like facade will be made of Swiss timber and will hence fit into the surroundings perfectly. 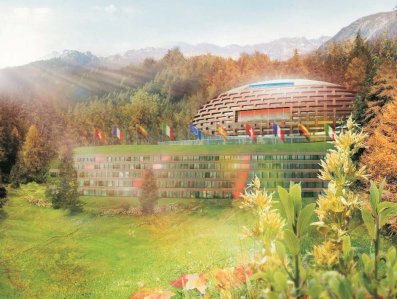 According to Bardo-M. Feuring of Feuring – Visionary Hotel Development, the InterContinental Resort Davos could become a very popular postcard motif as a result of its extraordinary architecture. The design is intended to become the subject of discussions and to stimulate the senses for modern architecture in this idyllic alpine panorama. The resort will offer a view over the ski slopes of Davos and will fit perfectly into the alpine landscape. With the unusual size and design of the resort’s conference and spa areas, InterContinental will definitely raise the standards for these features. Davos is only 1.5 hours drive away from Zurich airport and is internationally known as an ideal business and holiday destination. The whole world pays attention to the annual "World Economic Forum" which takes place here and has been a magnet to statesmen and other key personalities in the economic world for the last 35 years. The InterContinental Hotels Group already has a very attractive resort not far from Berchtesgaden, Germany. In Switzerland, the group operates two large conference hotels in Zurich and Geneva. Matteo Thun & Partners is an experienced hotel designer with an international reputation. Examples of the South Tyrolean designer’s work are the interior design of the Radisson SAS Hotel in Frankfurt/Main and the Side Hotel Hamburg, both in Germany. Feuring – Visionary Hotel Development is also responsible for the development of the very successful Steigenberger Hotel de Saxe in Dresden opposite the famous Frauenkirche, which opened its doors in the spring of 2006. Feuring – Visionary Hotel Development consults institutional and private investors as well as international hotel operators when it comes to developing new hotels or buying and selling existing hotel properties. It is known for the successful consulting and development of – amongst others - the Le Méridien hotels in Hamburg, Munich and Vienna. Further current projects include a golf resort in Greece, a resort in Garmisch-Partenkirchen as well as some city hotels in Mainz, Dusseldorf and Saarbrücken.